Milwaukee 2452-22 M12 Fuel 1/4 Drive Cordless Impact Wrench with 2 Batteries. 1/4 Impact Wrench optimizes torque in tight spaces. Built-in LED light illuminates work surfaces in dark locations. 3X longer motor life, up to 2X more runtime, and proprietary Milwaukee® 2-Mode DRIVE CONTROL? For better control over the power and speed required for specific applications. Brushless Motor outperforms all leading competitors with constant power output, yet runs cooler with no wearable components. Onboard fuel gauge helps you monitor the charge more accurately, so theres less downtime on the job. Peak Torque 50 ft-lbs (600 in-lbs). No Load Speed 0-2,650 RPM. No Load IPM 0-4,000. Lithium-ion Battery Charger (48-59-2401), (1) Belt Clip and Carrying Case. Arctic Tools A cool place for tools. Our in depth inventory and immediate availability to most name brand aftermarket tools gives certified technicians, and home repair professionals access to only the best automotive repair tools available. You will receive the tracking info from us as soon as the item ships. All items are set to USA standards. All items are Brand New unless otherwise noted. We can supply you with a receipt and help in any way possible but we can not take back products after the 7 days. If an item is received D. Arctic Tools can not make any exceptions. You may also be interested in.... 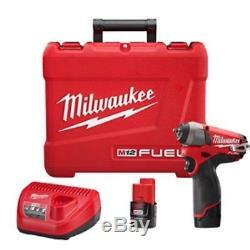 The item "Milwaukee 2452-22 M12 Fuel 1/4 Drive Cordless Impact Wrench with 2 Batteries" is in sale since Tuesday, July 10, 2018. This item is in the category "eBay Motors\Automotive Tools & Supplies\Power Tools". The seller is "arctic-tools" and is located in Saddle Brook, New Jersey. This item can be shipped to United States, Canada, United Kingdom, Denmark, Romania, Slovakia, Bulgaria, Czech republic, Finland, Hungary, Latvia, Lithuania, Malta, Estonia, Australia, Greece, Portugal, Cyprus, Slovenia, Japan, China, Sweden, South Korea, Indonesia, Taiwan, South africa, Thailand, Belgium, France, Hong Kong, Ireland, Netherlands, Poland, Spain, Italy, Germany, Austria, Israel, Mexico, New Zealand, Philippines, Singapore, Switzerland, Norway, Saudi arabia, Ukraine, United arab emirates, Qatar, Kuwait, Bahrain, Croatia, Malaysia, Brazil, Chile, Colombia, Costa rica, Dominican republic, Panama, Trinidad and tobago, Guatemala, El salvador, Honduras, Jamaica.